I have a dirty, little secret when it comes to my food. I have a habit of taking perfectly lovely food and concocting it into a blob of grossness on my plate. In fact, these almost verbatim words were spoken from the mouth of a very good friend not that long ago. "Why do you have to take perfectly lovely food and turn it into a blob of grossness on your plate? ", she said. "It's weird." I don't think weird is the adjective I'd use, but it's true. I do tend to enhance my dishes using unorthodox ingredients. For instance, one of my favourite quick comfort foods is dipping hot, buttered toast into my cold cereal milk - once the cereal has been eaten, of course. The sweetness of the cereal milk and the savouriness of the buttered bread makes for a delicious paring. I also love homemade macaroni and cheese on day two with the addition of a can of tuna and sweet peas. Let's not forget my embellished mashed potatoes. I'm not a fan of bog standard mash, but when I am in the mood for this popular side dish, it's imperative they are topped with gravy, baked beans, and a generous handful of grated aged cheddar cheese. But may I say don't knock it until you try it? I'm going to anyway. Don't knock it until you try it. The same can be said for many foods. Why or how did the foods we eat become to be the foods we eat? What made someone wander through the woods, find a patch of mushrooms, and say, "Hmm. I think I'll eat those!" Who stumbled upon a pineapple field and thought they looked amazing at first glance and later thought to toss them onto a baked ham or pizza? What crazy decided milk from a cow would be great over cereal, in coffee, or especially with a warm baked chocolate chip cookie straight out of the oven? Whom I ask? Well, someone did. And let's take a moment to thank each and every one of them. I think my slight food oddity, if you will, stems from my childhood. Funny enough, it seems to be a family affair. When my brother was still in his single digits, he LOVED strawberry jelly and processed cheese slice sandwiches. Barf, right? We all thought that. However, it made me think. Was he a genius before his time? Think about what party foods are famous for this. Cranberry? Brie? Baguettes? You see where I'm going with this? His simple sandwiches turned out to be a twist on a popular appetizer served at many a holiday party to this day. I am super stoked to team up with McEwan Foods to create a delicious, yet impressive and simple holiday appetizer that anyone would be proud to offer up at their next party or get together. 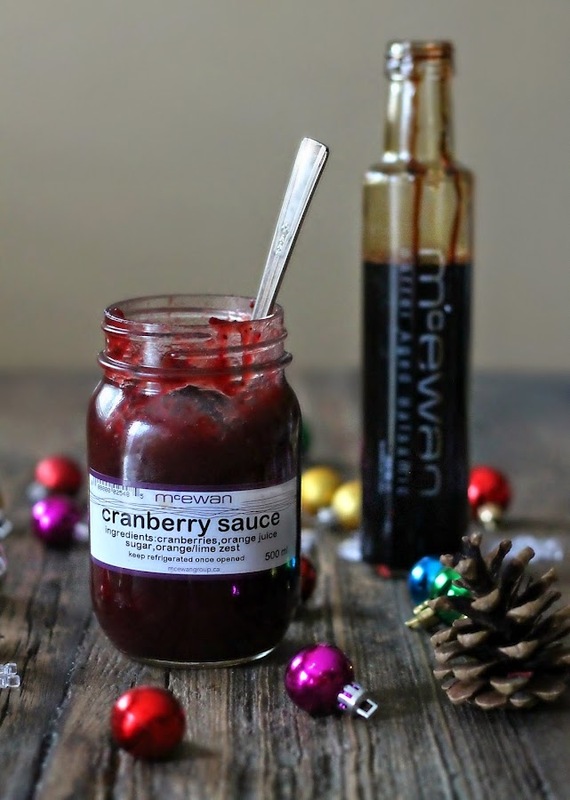 It boasts flavours from McEwan's own Cranberry Sauce with lovely hints of orange and lime zest incorporated throughout. Seriously friends, I could very happily eat this sauce straight from the jar with a spoon, but it's just as lovely with the addition of Brie, prosciutto, and a lovely loaf of crusty bread. I also took the liberty of drizzling a gorgeous balsamic glaze reduction and toasted walnuts to balance out all the flavours. It just goes to show one that food oddities, whether your own or those you hold near and dear to you, can spark serious creativity down the line, so embrace them. Place one cup of McEwan's Balsamic Vinegar along with brown sugar in a heavy-bottom saucepan over low heat. Simmer, stirring frequently, until vinegar is thickened or the back of a spoon is coated. Remove from heat and allow to cool. Sauce will thicken as it cools. Cut baguette into one-third inch slices, on a bias. Lightly coat with olive oil and bake for eight minutes at 375 degrees F until lightly toasted. Slice brie into thin strips and place on bread. Top with prosciutto and a generous teaspoon of McEwan's Cranberry sauce. Sprinkle chopped walnuts, if using, and drizzle balsamic glaze over assembled crostini. Embellish with mint leaves or arugula. Disclosure: I was compensated for this post by McEwan, but as always, any and all opinions and views are 100% my own. These look amazing, Jenny! Perfect for holiday entertaining. 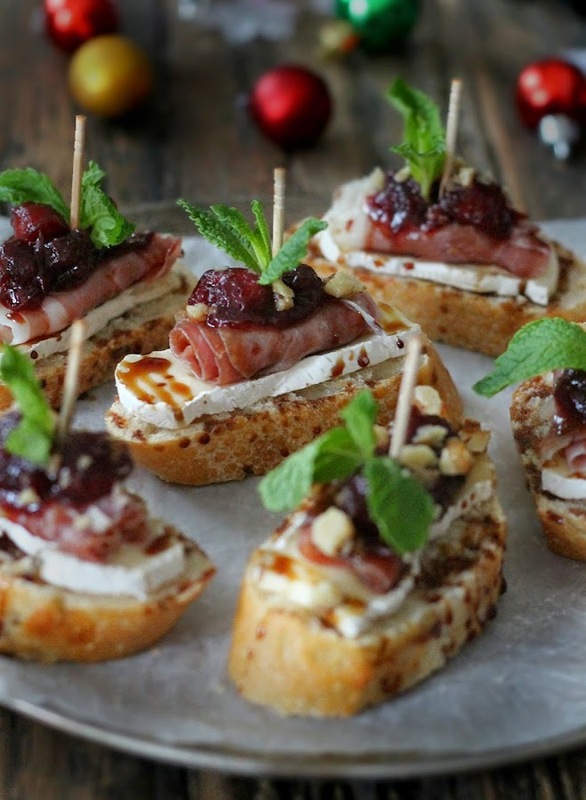 I usually skip the cranberry sauce, but I love brie and prosciutto atop anything crunchy. Oh, and since we're sharing weird food choices - I love crunchy peanut butter and sharp cheddar sandwiches and in university my most loved comfort food was fries dipped in strawberry yogurt. You are funny and I haven't heard the word *barf* for years. That being said, your appetizer looks amazing and your photographs are all lovely. These look amazing and your pictures are gorgeous! Lmao "barf right?" I totally did think "barf" when I read the jelly 'n cheese sandwich line but you're right - everyone puts cheese with a sweet fruit/jam/compote now! I think messy foods are the best foods and every dish that you described as "weird" sounds freaking amazing to me. I'd eat it all, including a tray of this crostini. It's so pretty and festive - like you topped bread with Christmas! Sounds good! I can't eat brie but I bet I could sub another cheese! Found you on Wicked Awesome Wednesday. 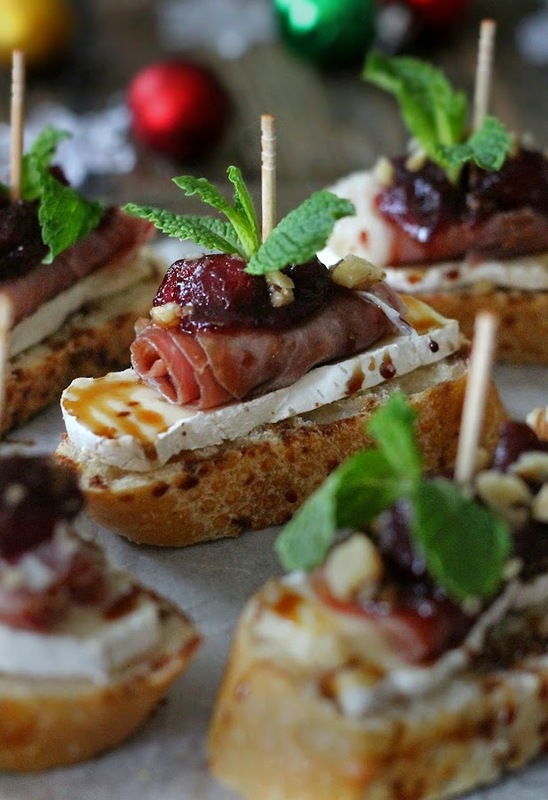 Pairing brie & prosciutto with something sweet is one of my favourite things! I usually go for fig jam, but these look so delicious, I'll definitely be giving cranberry jam a try. Thanks for sharing, Jenny! What temperature do you cook the bread at for 8 minutes? 350? These look amazing! How big is the bottle of Balsamic? Weird question, do you warm the Brie before assembling? How many crostini's can I make with those ingrediënts? It really depends on your ingredients. A smaller wheel of brie and baguette will yield smaller portions. What if we don't have McEwan's cranberry sauce or balsamic vinegar available? Can we substitute a different brand? I would definitely use a chunkier-style cranberry sauce. You can also substitute 1 tablespoon apple cider or red wine vinegar with 1/2 to 3/4 teaspoon sugar (depending on the sweetness level you prefer) for every tablespoon of balsamic vinegar needed. I'd love to serve this at my next party coming soon! I was wondering if you could share an simple tips on how to cut the brie smoothly and evenly? Thank you! A serrated knife does wonders for cheese such as Brie. Do you remove the cover from the brie before slicing? Wow this is so nice and delicious. I will definitely try to make this for my wine events. It will pair well with a nice pinot noir wine too!